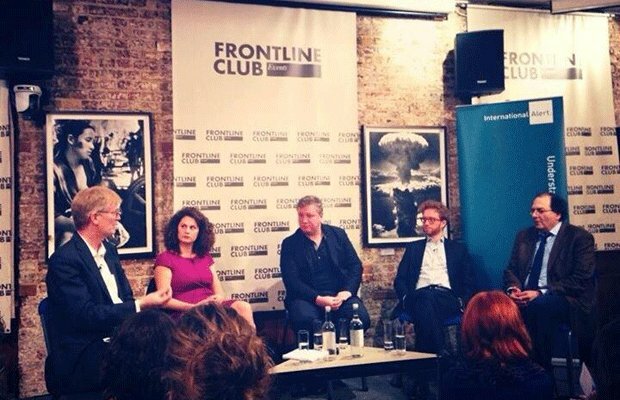 On Thursday 6 February at the Frontline Club, Dan Smith, secretary general of International Alert, chaired a panel which discussed the impact of the war in Syria on the surrounding states. Smith asked the panel what could be done to improve the situation in the region? Lebanon is absorbing many of Syria’s six million displaced people but the country has many of its own existing problems. An audience member asked if these problems had got worse since the influx of refugees. From the audience, Sarah Williams, who spent six months in Jordan last year, asked how the country has been stabilised by the Syrian conflict. The panel agreed that the battle lines may seem to be drawn along religious and ideological lines but they are in fact political. An audience member asked, what is the long-term solution? Carol Allen-Storey, a photojournalist in the audience asked, where are the visionaries of the future, who is going to inspire?